The name Brighton John will be remembered by Barticians for years to come following his historic win yesterday. 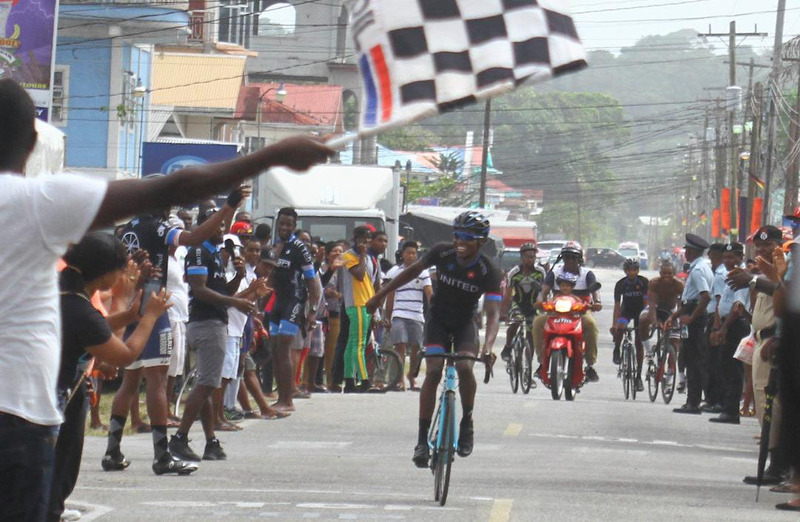 The United We Stand cyclist took a stunning solo victory on the asphalt of the Region 7 town by obliterating a field of the nation’s best bikers. His first big win of the 2019 season coincidentally came in the first ever road race staged in ‘the gateway to the interior’. John made hay in the brilliant sunshine lapping all but six of the starters to take the top honours of the gruelling 35-lap (42 miles) event after two hours, 22 minutes and 52 seconds of intense racing. 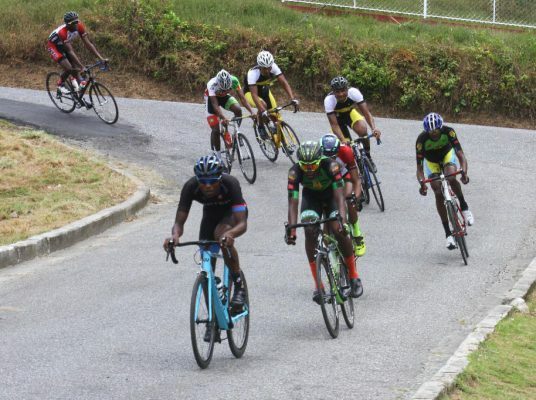 He led national road race champion, Curtis Dey and Christopher Griffith onto the podium in the presence of Director of Sport, Chris Jones and Mayor of Bartica, Gifford Marshall. Linden Bauxite Flyers teammates, Rastaff Oselmo, Michael Anthony and Griffith’s Evolution club mate, Paul DeNobrega completed the top six rewarding positions. 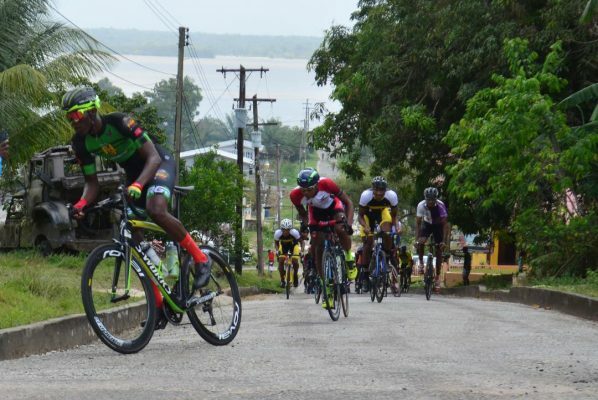 As the locals lined the streets to see the country’s best wheelsmen in action, the anticipation was fever pitched and the riders did not disappoint. The event started at a fast clip with a strong eight-man pack full of fire power taking it to the rest of the starters. The lead group inclusive of John, Dey, Romello Crawford, Griffith, Oselmo and Anthony established a sizable lead by the fifth lap as the steep 70m climb on Eighth Street separated the strong from the weak. During the ninth lap, John went solo and opened a 19-second lead on the Linden duo of Oselmo and Anthony. John, however, suffered a mechanical failure in the 14th lap. But that probably was a blessing in disguise as he seemingly caught a second wind with the changing of his rear wheel. From there on, he rode in time trial mode like a man possessed, lapping every rider within his sights despite their valiant efforts. The tireless John went on to win the event by almost two minutes ahead of Dey who had a late solo escape in the final two laps. Griffith then out sprinted Oselmo to take the final podium spot. In an invited comment, Mayor Marshall told this publication that he envisions the event being an annual fixture. “Definitely, as a matter of a fact, we are looking forward to hosting a next event by October of this year and from next year, we plan to make this an annual event. The riders will have a quick turnaround as the cycling season continues this morning in Berbice with the Courts-sponsored road race which starts at 13:00hrs in New Amsterdam.